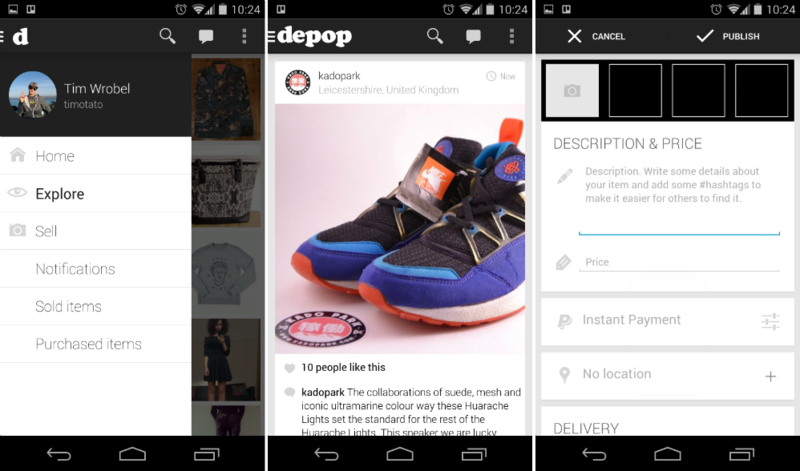 A new marketplace has popped up on Google Play called Depop, perfect for those of you who love dropping duckets on hip/boutique clothing. The app’s idea is very easy to grasp, as it is much like Etsy or any other young person clothing/accessory marketplace. If you have something to sell, snap a few pictures, add a description, and let the app do all of the work. People from all over are selling vintage shoes, skirts, tops, handbags, and everything in between. Buying is just as easy as selling, as users can hook up their PayPal accounts to the app, with one-click purchasing enabled throughout. If you have a question about an item, you can send a message directly to the seller through the app, so you can rest assured that you are buying exactly what you want. So far, it appears that Depop has a nice little community of users, mostly based in the UK. Hopefully once time goes by, the app will become more popular among American users as it was just released on Android. Got something sweet to sell? Follow these easy steps. If you happen to be into vintage sneakers or enjoy poppy boutique clothing, go grab it off of Google Play by following the link below. Flappy Bird Developer Speaks Out, Says Game Became "Too Addictive"